This afternoon I went to see Looking for Eric, the new film by Ken Loach, which was well received by critics at the Cannes Film Festival (though it didn't win any prizes). The film tells the story of Eric, a depressed, middle-aged postman, who is also a Manchester United fan. His second marriage has failed and he has to look after his two teenage stepsons, who treat him like a doormat. Worst of all, when Eric meets his first wife, he realises that he is still in love with her. The only man who can help Eric out of his mid-life crisis is his namesake, footballing legend Eric Cantona, who magically appears in his bedroom, offering typically enigmatic pieces of advice. A very entertaining film with a superb performance from Steve Evets as Eric the postman. We also get to see some of Eric Cantona's greatest goals. (He's a better footballer than he is an actor.) Being a Ken Loach film, there are some darker themes of poverty and desperation, but it's probably the closest we're going to get to a feel-good film from the veteran British director. The final scene involving several coachloads of fans wearing Cantona masks is wonderful. This cartoon by Garland in the Daily Telegraph suggests that the empty plinth in Trafalgar Square should be used for a statue of a group of politicians announcing their resignations. The inscription on the plinth reads: "We haven't done anything wrong." 2. Several MPs have announced their resignations in recent days following the expenses scandal. Many of them have defended their actions by saying that they had kept within the rules—hence the inscription "We haven't done anything wrong." We have done nothing wrong means the same as We haven't done anything wrong. See here for notes on how to use anything. Students have one minute to present their candidate for the empty fourth plinth. Hold a ballot to choose the winner. Hot favourite Susan Boyle was beaten into second place by 10-piece street dancing act Diversity in last night's Britain's Got Talent final. Here's the exciting moment when the winner was announced followed by Diversity doing their act. I don't have satellite TV but was able to watch the show as it was streamed live on the Internet. I think Susan Boyle would have won if she'd hadn't played safe by repeating her original YouTube hit "I Dreamed a Dream". She won't be too disappointed, though—the papers report she is heading for a recording contract and a £5m fortune. Diversity took 24.9 per cent of the public vote, above Boyle’s 20.2 per cent share. The contestant in third place, the saxophonist Julian Smith, gained 16.4 per cent. 1. If you grill someone over (or about) something, you ask them a lot of questions for a long period of time. • The police grilled the suspect about the murder for four hours. 2. If you describe something as a fiasco (from Italian fiasco, "flask"), you think it is a total failure. • The Speaker was forced to resign following fierce criticism from MPs for his handling of the expenses fiasco. • The marketing campaign turned into a fiasco when the company was unable to meet the demand. I've been listening to Feist a lot recently. Here's a great video for the song My Moon My Man from her album The Reminder. Apparently, it was filmed in one continuous shot. You can find a version with the lyrics here. This Peter Brookes cartoon from The Times shows Gordon Brown as Susan Boyle. The cartoonist draws a parallel between Gordon Brown's performance as UK prime minister and Susan Boyle's behaviour since she won the first round of Britain's Got Talent. 3. Jeez is an exclamation of shock, surprise or annoyance. Jeez is short for 'Jesus'. 4. If you blow a chance, you make a mistake which wastes the opportunity. • Shaheen thought that he had blown his chance of stardom when Simon Cowell told him to stop singing. Tom Johnston has a great BGT cartoon in today's Sun. If you say something is "in the bag", you mean that you are confident that you (or someone else) will get it or achieve it. (The Sun article reports that Amanda Holden, one of the BGT judges, believes Susan Boyle will win.) • It looked like the Italians had the game in the bag until 2 minutes into injury time when Galatasaray equalised. But there's a second level of meaning. "Boyle in the bag" is a play on the expression "boil-in-the-bag". Certain food products, referred to in English as "boil-in-the-bag" products are supplied in a closed bag with the intention that the entire bag will be immersed in boiling water to heat its contents. Rice is often sold in this way. The Phrase Finder has an article explaining the origin of the expression "in the bag". Apparently, it dates from the 1920s and refers to a superstition involving the ball bag in baseball. All together now: "He has a big, big Popy Nano." You'll find a lot more of this sort of thing on AD MAD World: A Collection of Indian Television Ads. Bing is getting some good reviews (see below), but it will take something really special to tempt people away from Google. And I'm not sure about the name. Microsoft boss Steve Balmer said that he liked Bing's potential to "verb up" (Google, of course, has become a verb). He also said "it works globally, and doesn’t have negative, unusual connotations." Well, sharing a name with the archetypal "crooner" Bing "White Christmas" Crosby might not be seen as the height of cool. And will we be "binging" ourselves a year from now? Time will tell. France hasn't invited a single member of the British Royal family to its D-Day commemoration. ITN's Nina Nannar reports. This cartoon by Steve Bell from The Guardian refers to the 'row' over the French government's failure to invite the Queen to the D-Day commemorations in Normandy next month. The picture is meant to represent a souvenir postcard. 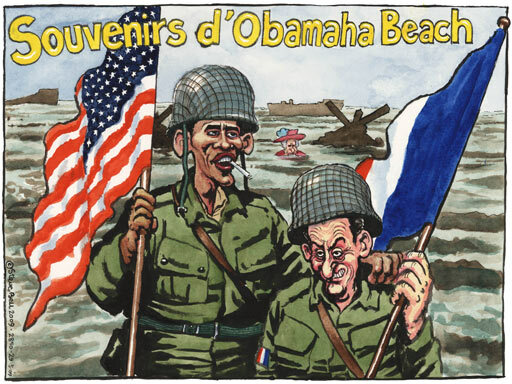 We see Presidents Obama and Sarkozy as soldiers on Omaha Beach on D-Day. Obama has his arm around Sarkozy's shoulder. They are carrying their national flags. If you look carefully, you can see the Queen in the water behind them. The message is clear—France and the USA are best buddies, while Britain is snubbed. 1. There's a nice play on words with Obama and Omaha, which are combined to give Obamaha. 2. A souvenir is something you buy or keep to remind you of a holiday, place or event. It's a false friend for French speakers since 'un souvenir' is also 'a memory' in French. In English, a souvenir can only be a physical object. • I brought back a miniature Eiffel Tower as a souvenir of my holiday in Paris. Here in France, this story is not receiving the same level of attention as in the UK. It got the briefest of mentions on the national news last night. In any case, it seems that it's the fault of the British government if the Queen wasn't invited. a sum of money given to a senior executive on his or her involuntary departure from an employing organization as a form of severance pay. A golden handshake can be offered when an executive is required to leave before the expiration of his or her contract, for example, because of a merger or corporate restructuring. It is intended as compensation for loss of office. It can be a very large sum of money, but often it is not related to the perceived performance of the executive concerned. Similar terms include golden umbrella and golden parachute. Here is the CNN Student News for May 29th. Click on the links to see a transcript. West Bank Settlements - Learn about the unsettled issue of settlements in the West Bank. Education Budget Cuts? - Hear how a proposed budget cut could impact California students. Hurricane Readiness - Consider how prepared some Americans are for hurricane season. Traveljargon.org is a dedicated, interactive portal which aims to provide concise definitions of terms used in the travel industry. Here you'll find the A - Z of terminology, acronyms, and expressions for business or leisure travel, airlines, hotels, car hire, conference and meetings, rail, cruising and tourism. Compiled and continually up-dated by the travel community, Traveljargon.org is free to use. To get an A-to-Z listing of all the terms, just click on the Search button. Google has just announced Google Wave, a new in-browser communication and collaboration tool that is already being hailed by some as the next evolution of email. Yes, Google Wave is potentially that disruptive. Created by two of the guys behind Google Maps with a small team in Sydney, the concept behind Google Wave is to “unify” communication on the web. It’s a hybrid of email, web chat, IM, and project management software. It features the ability to replay conversations because it records the entire sequence of communication, character by character. Because of this, discussions are also live in Google Wave: you will see your friends type character-by-character. I've no idea what the potential educational uses of Google Wave might be, but it's certainly getting a lot of positive buzz on the Internet. You can read Google's own take on the Official Google Blog.